THE IDIOTS' BOARD: CROCS EAT CROCS? Idiots learn to believe the idea of cannibalism in some reptiles like crocodiles. They eat something in their own species. Evidence is shown that crocs eat cros. Bad cheetah crocodile. In addition to that newly acquired knowledge, Idiots believed that such nature is pretty normal and cute for crocs to eat their same kind. 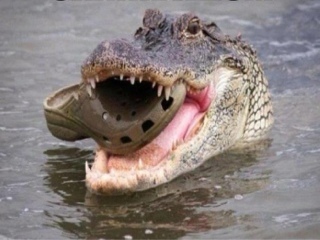 After all crocs don't even understand cannibalism. In the event of these reptile's lives whether they're cannibals or not, there are no commandments nor religions to follow. Neither heaven nor hell. The sad thing about it is, even brands of crocs' apparels are subject to its cannibalism. So, they're capable or recognizing crocs branded garments. A very intelligent idea. So beware crocs branded lovers. Crocodiles are hunting after you. These brands are not patented.